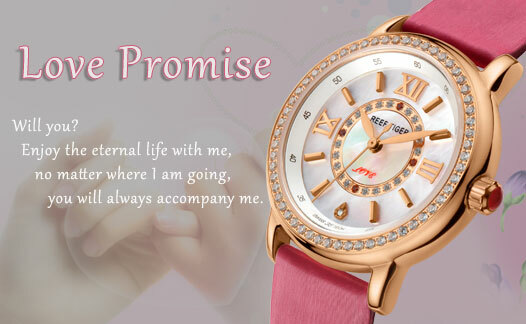 Promise uses a 34mm case, its overall feeling is generous and fine. With soft lines, smooth and rounded polishing, the watch perfectly interprets the refined femininity. 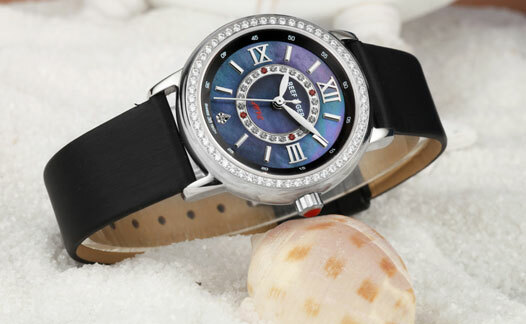 Rose gold watch is gentle and bright, white stainless steel model is cool and elegant. 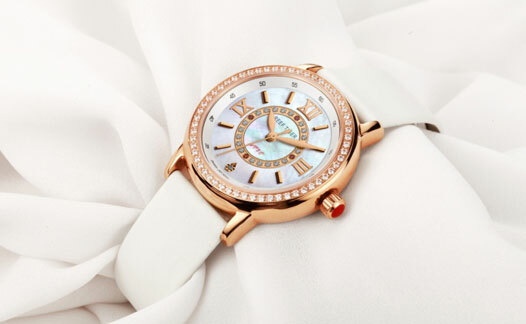 Pearl has always been the best gift for women since ancient times, promise watch uses mother of pearl to make dial, after being carefully processed, it emits shiny luster, each piece of dial is a gift of nature, unique. Designers use unique approach to pave 58 pieces of Swarovski crystals on the bezel, each has shiny color. There are also 24 diamonds as hour markers, full of feminine elegance. Love is not always sweet and laughter, there are sometimes misunderstandings and tears, promise watch uses a tear-shaped diamond as hour marker at 6, after the tears, you will get a clearer sense of the future and a better life. The watch adopts Italia imported calfskin leather and colorful satin silk band, which adds some tenderness and fantasy to the watch, whether it is a daily appointment or occasional fashion match, the watch will become the most beautiful accessory, and completely show women elegance.